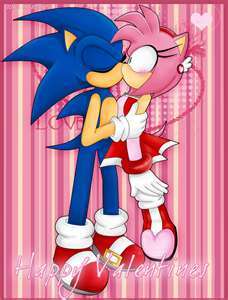 amy and sonic in Amore. . Wallpaper and background images in the Sonic the Hedgehog club tagged: sonic amy. This Sonic the Hedgehog photo might contain anime, fumetti, manga, and cartoni animati. This is a Sonic club, not a Sonamy club. As for the art itself, very good artwork. This is how the world should be.